I’ve always loved GHQ’s ‘Micronaut’ line of 1/2400 scale warships. Intended to be used as wargame counters, these models are simple to assemble and ridiculously tiny, but the detail on them is first rate! 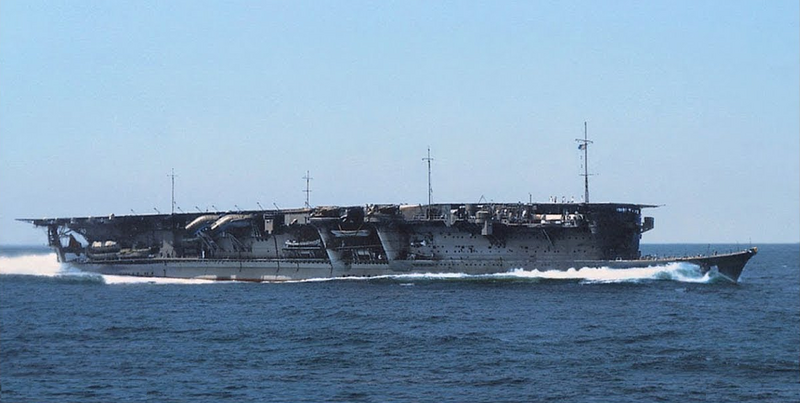 This time I’m taking on one of the Imperial Japanese navy’s ill-fated light aircraft carriers, the IJN Ryujo. At about three inches in length and consisting of just three parts (plus aircraft), this model should be a fast build! Interesting looking little beast, I have enough trouble seeing stuff in 1/350. Have fun with this mate, will be following along. Thanks, Si. Yes, this ship will be pretty small, so I thought it would make sense to put it on a base. I started with an old Nichimo 1/200 U-Boat stand. it looks to be just about the right size to showcase the little carrier. Now that is the size of model the wife would like me to work at. She keeps asking me where are you going to put these models that you complete. I can't wait to see her painted. As for Ryujo, she is ready for paint! Other than cleaning up mold lines and a small amount of Mr. Surfacer to smooth the seams, the only alteration I made was to omit the solid-molded flight deck supports aft (which will be replaced later with plastic strips). She now wears a coat of Tamiya rattle-can Light Grey primer. I used to have a bunch of their 1/285 armor, but my entire collection got stolen out of a storage unit I had tucked them away in during a move to NYC. I never bought any ships, but I did stare at them hanging on the spinner racks at my old LHS back in the heyday. Tim: I don't know if you are aware or not, but there is a company that makes full deck decals for most of the carriers manufactured by GHQ Micronauts. I have seen some beautiful examples. Don't recall the company name off hand, but if you go to the forum section of the Micronauts web site, you should find links and examples. They also do flight deck decals for some of the Micronaut modern surface combatants. In this series Lexington (2), Saratoga, Yorktown (5) Enterprise, Wasp (7), Hornet (8),Yorktown (10), Ticonderoga, and Lexington (16) are splendid models. Ranger is good, but not as good as the others. I look forward to seeing her painted. Tiny model. Tiny planes! Tim: I don't know if you are aware or not, but there is a company that makes full deck decals for most of the carriers manufactured by GHQ Micronauts. Thanks, Chuck. Yes, Dan Arute's Flight Deck Decals 2400 offers some great looking flight deck markings. I can't wait to try them out! The picture of the carrier on your finger tips really does how small it is. You're right, Si; it IS small! I have a pair of Dollar Store eyeglasses, plus I wear an optivisor over them to see the REALLY small stuff. Still, if no one can see it, I can get away with a lot more mistakes, right?! Not only is the ship small, but making convincing oceans in 1/2400 is a challenge too. My usual go-to scale ocean making materials, spackling paste and Celluclay, wouldn't really work well in this tiny scale, so for this project I thought I'd try something different. Taking a sheet of high quality artist’s drawing paper intended for watercolors, I traced and cut out an outline of the ship. I like this material because the paper has has a delicate, regular texture which resembles small waves. After gently rolling the paper over a pen to create a lightly undulating “sea”, I lightly attached it to the base with dots of cyanoacrylate (super glue). Once I was happy with the positioning, the whole paper got a soaking with the cyano. This fixed it securely in place and made it rock hard. Then I trimmed the paper and sanded the sides smooth to integrate the sea seamlessly onto the base. With the ship test fitted, it looked good – at first. Looking closer, I realized I’d made a basic mistake. The little “wave” shapes stamped into the paper were at right angles to the larger rolling waves into which the ship was heading – something that would never happen in real life! My wife looked at it and assured me that it was so small that no one would ever notice…but I knew it would drive me crazy, so I just went ahead and stripped it all off the base. It would have drove me crazy also. Nice job setting the base. Where can you get teeny-tiny PE (railings)? I've got Flyhawk's 1/2000 Bismarck and would like to put some railings on it. Where can you get teeny-tiny PE (railings)? Hmmmm I don't know. I hadn't planned to include railings… is this a challenge? Thanks Mark. Once I recovered my composure after that wasted first effort, I cut another piece, this time with the paper oriented correctly, and repeated the fitting/cyano/sanding process. I guess the wife was right – the difference really isn’t all that noticeable – but this time I got it right! Looking very interesting this build. I too would love to see railings in this scale on Ryujo! Anyway, she’s now primed up and ready for paint! – although there is a threat on the horizon! that's once more a very special one!! Looks great, and it really is amazingly small. I don't think I could handle that, even with optivisors. I'll be following, of course!! Working your magic in micro scale again! The base looks very nicely in scale. "size matters, not! Judge me by size, do you?"